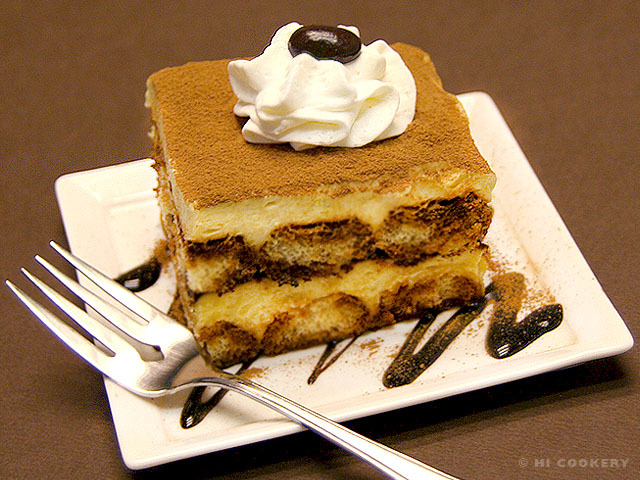 Tiramisu is a traditional Italian dessert that we always order at Italian restaurants in North America. So when we were able to visit Italy (Rome, Florence and Venice) a few years ago, we wanted to try the authentic treat. Whether we ate tiramisu simply sliced and served on a plate or from fancy shot glasses or classy cups, we savored the rich, creamy and potent dessert. With several shots of espresso flavor and sometimes sweet Marsala wine and brandy infused in the dessert, tiramisu really “picked us up” and we had enough energy to continue touring the Italian towns! This no-bake confection is like a cross between a cheesecake and trifle. For an impressive dessert, it is not as difficult to make as it seems. 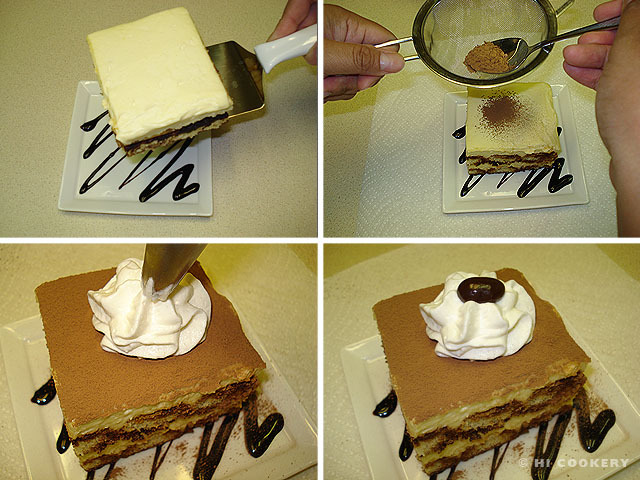 For National Dessert Month, try making traditional tiramisu to “pick you up” as the season turns into fall! Make the zabaglione cream by beating the egg yolks with sugar in a bowl until the mixture turns to a pale yellow color. Place the bowl over a pot of boiling water (double boiler). Reduce the heat to simmer. Gradually add the Marsala, beating continuously until thick. 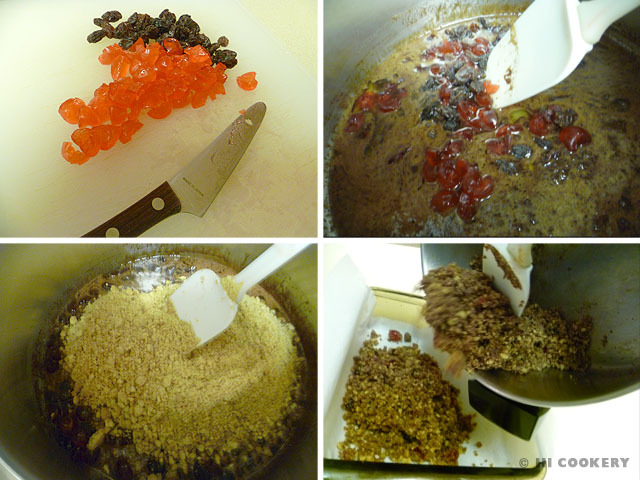 Pour the mixture into another bowl, cover and refrigerate for half an hour. Meanwhile, make the cream filling. In a mixer, whisk the heavy whipping cream with sugar until stiff peaks form. 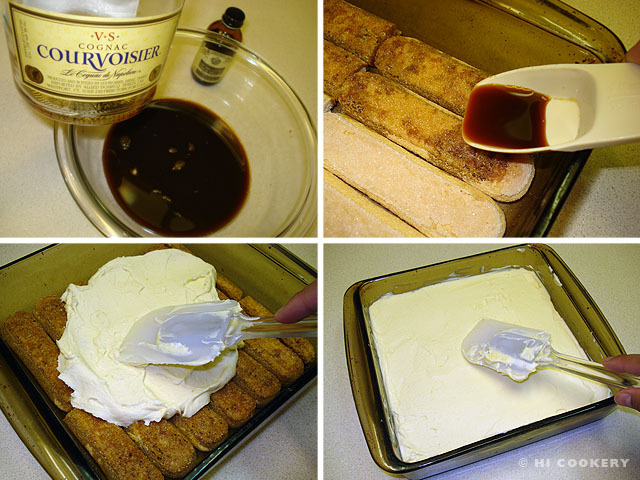 Fold in the mascarpone cheese. Add the cooled and thickened zabaglione cream to the mixture. Blend until smooth and softened. Prepare the cookie base. 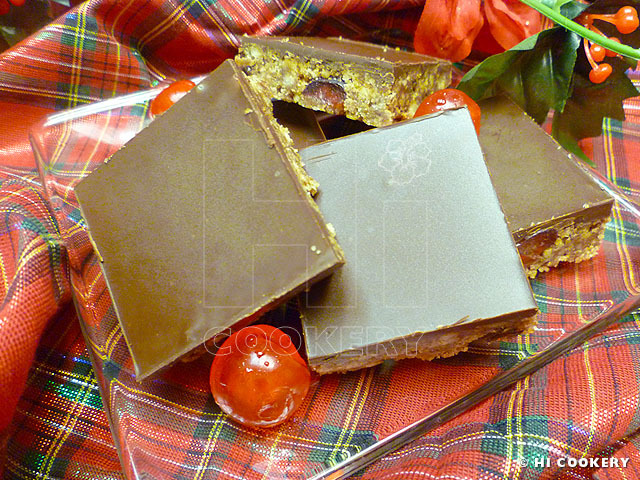 In an 8x8x3-inch square pan, arrange the lady finger cookies in a row, slicing off pieces to fit, if necessary. In a small bowl, mix the espresso or coffee with vanilla and brandy or Marsala. 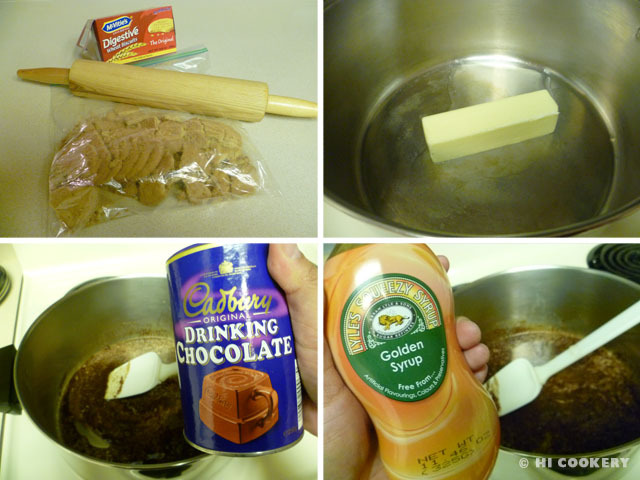 Pour a tablespoon of espresso/coffee mixture on top of each cookie to soak well (or dip each cookie in the bowl). Layer half of the chilled filling over the soaked lady finger cookies. Sprinkle the top with about one tablespoon of cocoa powder using a fine sieve. Repeat the process of arranging and soaking the cookies as the next layer. Finish with a layer of filling. 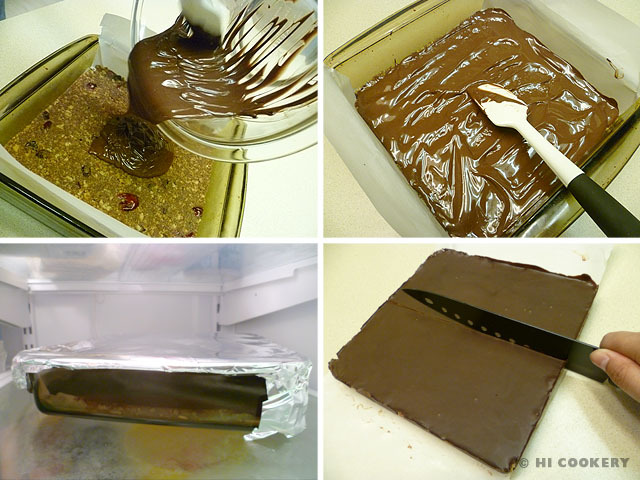 Cover with plastic wrap and refrigerate overnight to allow the cookies to soften and the flavors to blend together. Serve by drizzling chocolate syrup/sauce on a dessert plate. Put a slice of tiramisu on the drizzles. Sprinkle the top with cocoa powder using a fine sieve. 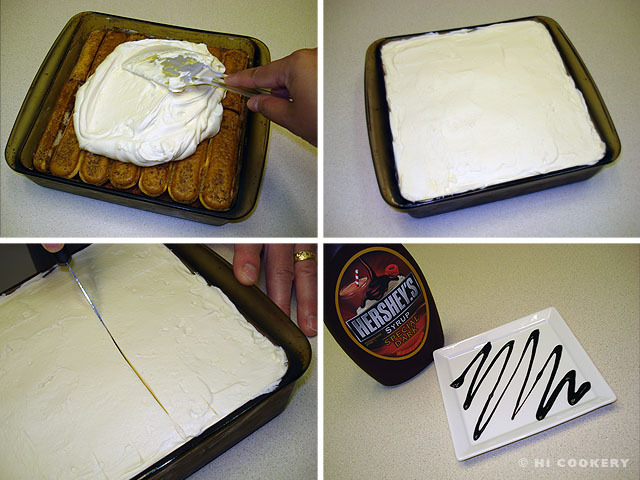 Pipe a rosette of whipped cream on top and garnish with a chocolate-covered coffee bean. 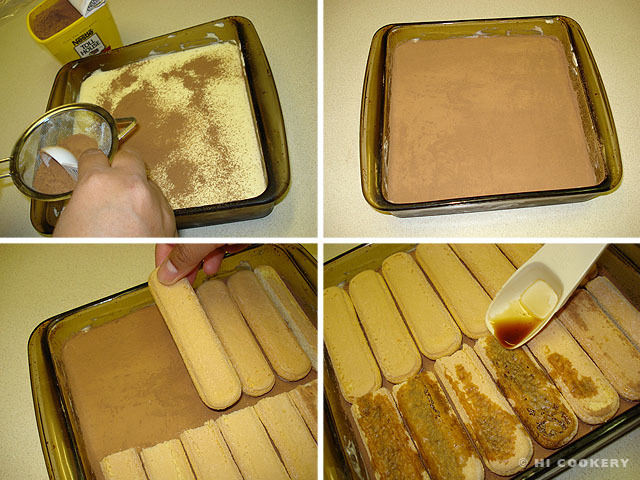 Cover any leftover tiramisu to prevent the lady fingers from drying out. Grazie (thank you) to Lisa L. for the Marsala from Sicily. She served on this Italian island as a U.S. naval reservist and bought a bottle of the booze for our blog! 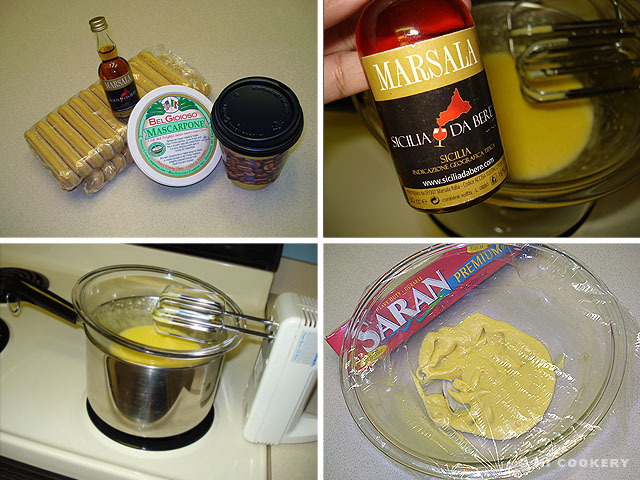 Use half the amount or eliminate the Marsala in the zablagione cream for a less liqueur-tasting tiramisu. 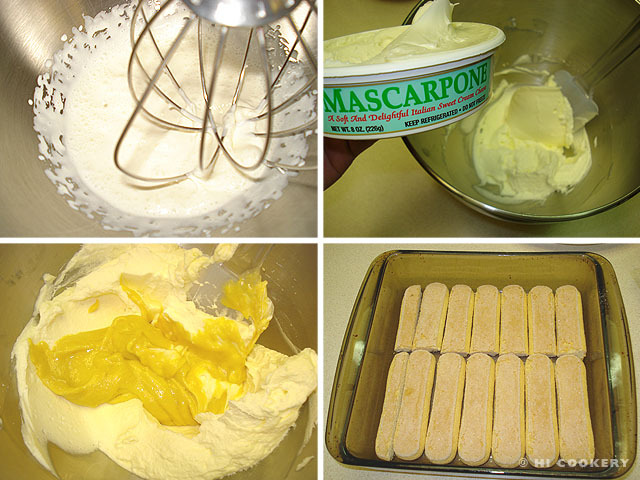 For a similar mini-version of tiramisu, try the recipe for St. Roch’s Fingers, which we posted on our blog on the Feast Day of St. Roch on August 16.